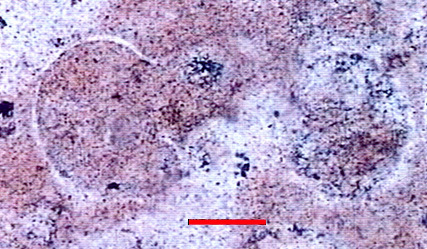 Mode of occurrence: Small irregular nodules, or flat cobbles. Cortex: Worn and smooth, or alluvial neo-cortex (cobbles), 1 to 5 mm thick, transition sharp. Colour: Greyish brown to light brownish grey (2.5Y 5/2 to 6/2). Pattern: Featureless, otherwise either randomly flecked with white specks or faintly mottled; a few large patches of unreplaced matrix. Appearance: Poor homogeneity (pores), lustre dull to medium, opaque, moderately smooth, medium-grained. Structure: No particular structure, apart from one sample which displays convoluted bioturbation figures and a fluidal arrangement of grains in some areas. Grains: 20 to 25 %, pale, rounded with high to low sphericity, or irregularly shaped, often agglomerated and surrounded by recrystallization haloes; rather poorly sorted (100 to 500 µ, mean size 250 µ). Grain composition: Bryozoan fragments, globose planktonic foraminifera (Hedbergella ? 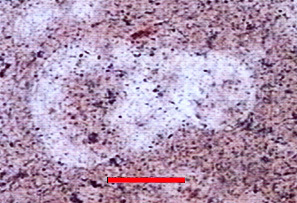 with a marginal keel), variable amount of fine-walled monaxon spicules. Globotruncanidae (Hedbergella ?) in a CN4c flint type. Geographical description: The material was collected near a slight rise within a large bend of the river "le Suran", just to the NW of St. André, some five kilometres west of Poncin. Other types of flint: Apart from the CN4c-flint described here, also several other flint-types of Senonian age can be found here: CN2a, CN2c, CN3a, and CN3b, as well as Early Cretaceous Ht3 silex. Other types of flint: Besides the CN4c material, flints of the CN2b and CN5 type (both of similar age) might be found here. Geographical description: The sample was collected on some fields directly to the southwest of Solomiat, a very small village/hamlet just off the main D 979 road, approx. 10 kilometres west-northwest from Nantua as the crow flies. Co-ordinate precision: The coordinates given were taken from a large-scale map, and will be accurate to a level of approx. 50 metres. The latitude/longitude coordinates are a direct transformation of these data on WGS84 and are accurate to the same level, the high presicion to the arc-second is given to prevent the introduction of addition inaccuracy. Geology: According to the geological map, the substrate consists of clays-with-flint (unit Rs), resulting from the decalcification of Late Cretaceous formations. 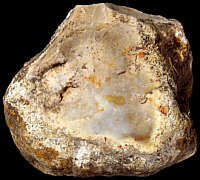 Other types of flint: Besides the CN4c-type, the CN4a variety can be found here too. Other types of flint: Apart from the CN4c-type, also two other flints of Senonian age can be found here, namely CN1a and CN2b. Other types of flint: As so often on secondary sites, quite a lot of other types of flint can be found here, mostly of Late Cretaceous age: CN2b, CN4a, CN4b, as well as the Cenozoic "silex lacustre" of the T1 type. 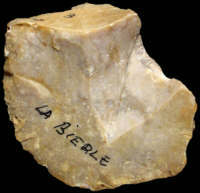 Geographical description: The sample was collected along a path between the hamlets of Cheneval and Breignes, a hunderd metres to the west of sampling site 34, Poncin / Breignes - Pierre-Feu 2, and 700 metres east of the "le Chanay" farm. Co-ordinate precision: The coordinates are to the nearest 50 metres on a detailed topographical map. The Lat/Long are a direct transformation of these on WGS84, within the same limits of accuracy. Geology: According to the geological map, the substrate belongs to unit m2bC-Rs : Late continental Miocene (Tortonian) and possibly clays-with-flint of Late Cretaceous origin. 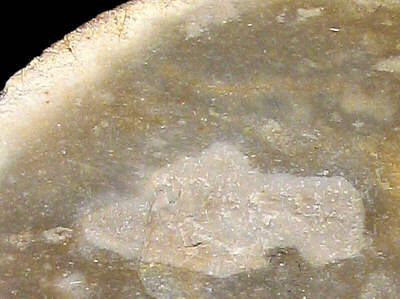 Other types of flint: The Late Cretaceous CN1a and CN2a flints occur here too.